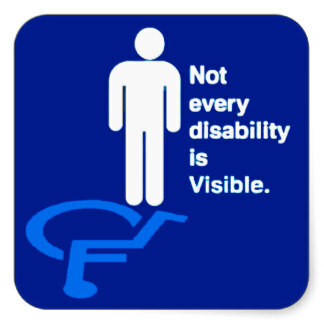 My Disability May Be Invisible, But I’m Not! | Disability.Blog. Many people are genuinely willing to help, but do not know where to begin. Because of this, we often offer by saying, “Call me if you need anything.” This is a great effort to reach out, but unfortunately, it does not work. For that reason, we cannot put the ball in their court and expect them to call us. So, how can we help if they will not ask when they need it? Simple…we call them! Most of the time, I feel I have to apologize for not meeting other people’s expectations of me, even if I am greatly hampered by my various conditions, all of which are hidden, invisible, and unmarked. I often feel that I need to wear some visible sign that I can point to, so I can remind myself and others of the various challenges I experience, regardless of how comparatively mild and unremarkable they may be. Then, I remember that I am not on this Earth to explain and apologize for my existence. As an added bonus, here’s an awesome Bingo card! Share it with your friends!